The complex aims to expand the repertoire of spatial typologies in which art can be exhibited. 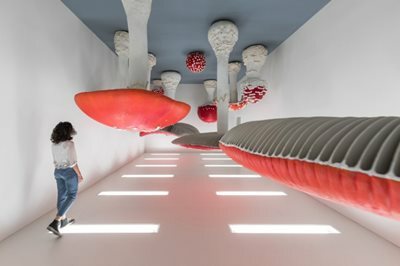 The project consists of seven existing buildings, and three new structures: Podium, a space for temporary exhibitions; Cinema, a multimedia auditorium; and Torre, a nine-story permanent exhibition space for displaying the foundation's collection and activities. Torre, currently undergoing construction work, will be open to the public at a later date. Within the perimeter of the Largo Isarco complex existed two freestanding structures: one flat and square and the second more vertical. On close inspection, the square building did not offer attractive possibilities and was demolished, enabling the courtyard to become a significant element for open-air use. The Deposito, an existing building on the west edge of the complex, is adapted for curatorial ingenuity: in its basement, the Fondazione's collection is arranged in a hybrid of strict storage and partial display, creating 'chambers' where work such as a fleet of artists’ cars can be unpacked or half opened to the public. Four 'houses' that face the courtyard to the north and an abandoned garden to the south accommodate Fondazione offices and permanent galleries. Within their confines sits the ‘Haunted House’, an existing building with its exterior covered entirely in gold leaf. Inside, the intimate scale of its interiors generates a ‘domestic’ setting for specific works. Adjacent, the Podium forms the center of the compound, sitting at the intersection of the two perpendicular axes through the site. This addition combines two volumes of very different qualities: a fully glazed, column-free podium on the ground floor. Resting on top is another gallery space clad in aluminum foam , with a bubbled pattern. Both galleries provide large, multi-purpose areas for temporary exhibitions and events. It is surprising that the enormous expansion of the art system has taken place in a reduced number of typologies for art's display. To apparently everybody’s satisfaction, the abandoned industrial space has become art’s default preference -- attractive because its predictable conditions do not challenge the artist’s intentions -- enlivened occasionally with exceptional architectural gestures. The new Fondazione Prada is projected in a former industrial complex too, but one with an unusual diversity of spatial environments. 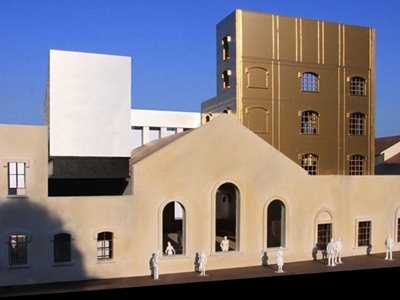 To this repertoire, we are adding three new buildings -- a large exhibition pavilion, a tower, and a cinema -- so that the new Fondazione Prada represents a genuine collection of architectural spaces in addition to its holdings in art.The Fondazione is not a preservation project and not a new architecture. Two conditions that are usually kept separate here confront each other in a state of permanent interaction – offering an ensemble of fragments that will not congeal into a single image, or allow any part to dominate the others. 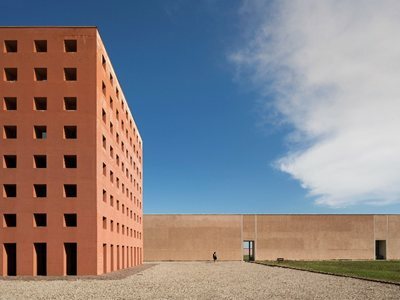 New, old, horizontal, vertical, wide, narrow, white, black, open, enclosed -- all these contrasts establish the range of oppositions that define the new Fondazione. By introducing so many spatial variables, the complexity of the architecture will promote an unstable, open programming, where art and architecture will benefit from each other’s challenges.